Watercoloring with Builder Stamp Sets + GIVEAWAY! Happy Monday, all! 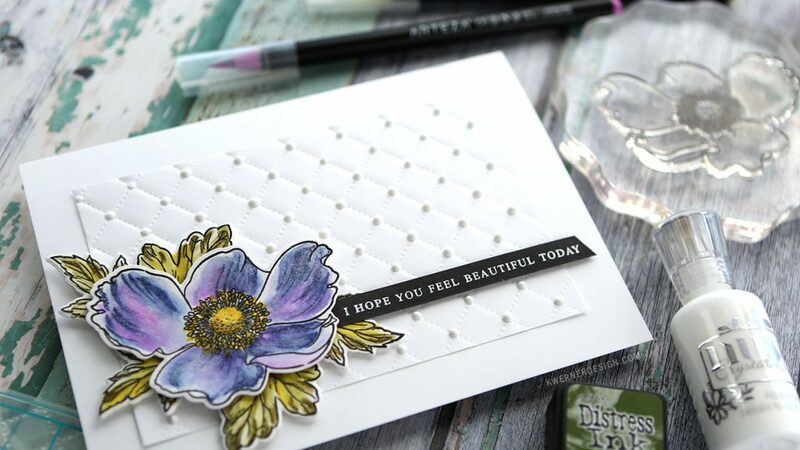 Today’s post is part of a blog hop celebrating Altenew’s Build-A-Flower line of stamps! Altenew is well known for their amazing builder stamp set featuring flowers. See the entire Build-A-Flower collection HERE. They are amazing for using different colors of ink to create an image with depth and shadow. I thought it would be fun to play a bit with that idea and add in some watercoloring. Stamp outlined image on Bristol paper. Ink detailed image with Distress Ink (I used Chipped Sapphire and Mustard Seed for the flower, and Forest Moss for the leaves). Stamp detailed image and immediately soften with water brush or a wet watercolor brush. Add color using a watercolor marker (I used Arteza watercolor markers). Soften with water brush or wet watercolor brush. Using both Distress Ink and a watercolor marker allows for a bit of the detail to show, but also for some soft color. To finish off my card, I used one of the Quilted Next Level Embossing Folders from We R Memory Keepers and added pearl-like dots of Nuvo Crystal Drops in Simply White to the intersecting lines of the pattern. 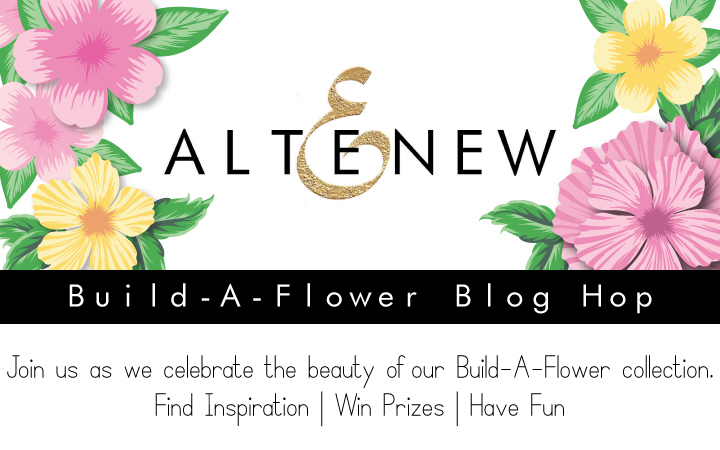 Altenew Build-A-Flower Blog Hop + GIVEAWAY! Like I mentioned above, this post is part of a blog hop! And there are THREE giveaways, too! Altenew is giving away a $30 gift certificate to six lucky winners! Please leave a comment on the Altenew Card Blog and/or Altenew Scrapbook Blog by Friday, March 2nd for a chance to win. Six winners will be announced on the Altenew blogs on Sunday, March 4, 2018. Place an order from the Build-A-Flower Collection from 2/26/2018 until 3/2/2018 at Altenew.com, and you will automatically be entered into a raffle for a chance to win a big prize! One lucky winner will be chosen to win a prize pack valued at over $120 including one Original MISTI stamping tool, Artist Markers Set C, and Soft Pastel 6 Mini Cube Set. No minimum purchase needed! A winner will be announced on March 4th on the Altenew Blogs. I also have a giveaway here at my blog. I have $20 Altenew gift certificate to giveaway courtesy of Altenew! Thanks, Altenew! For your chance to win the gift certificate, please leave a comment on this blog post by 9am on Saturday, March 3, 2018. Giveaway winner will be randomly selected and added to my Giveaway Winners page. Winner will be contacted by email so be sure to include an email address you check often. Winner will have 48 hours to claim their prize. Thanks! So get those comments in and good luck! Your next stop on the hop is Therese Calvird. Thanks for stopping by!